Sometimes the best things in life are free! I couldn't agree more when it comes to toddlers. Often times they will choose to play with household items instead of their own toys. So why not incorporate some learning in with all that fun! 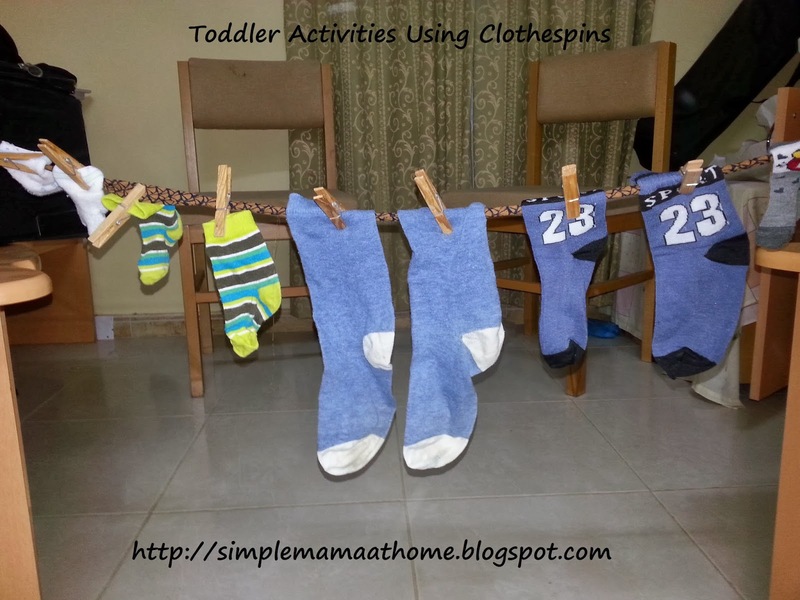 Recently, my son has become very fascinated in clothespins. It got me thinking as I was watching him enjoy emptying these pins from the bag they were in to all over the floor and then placing them back into the bag. I was thinking there must be something we can do to make this so simple household item into an educational tool. 1. Development of fine motor skills. 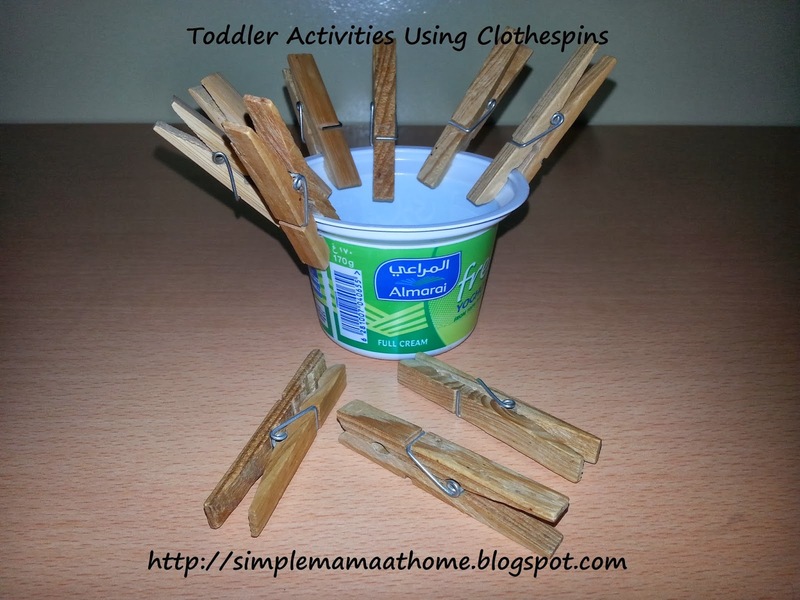 Attach the clothespins to an empty container. Have your toddler pick the pins off one by one and empty them into the container. 2. Make a pretend clothesline. String up a line and let a little one practice trying to pin the socks up and take them down. 3. Color and shape match-up game. Cut out some shapes using cardboard and color each one a different shade. Then color one side of each clothespin to match the shades of color on each shape. What cute ideas! I live all of your tips! thanks for sharing! haha! i so can relate to this! my little one loves to play with some electric fans here.. instead of playing with her own toys.. This is a really smart idea. Funny how the little things in life seem to be the most fun for kids. My daughter can spend days playing with a cardboard box..lol. That is a smart and east idea to incorporate into a child's day. My kids used to play with the kitchen utensils. really neat ideas. And great for a kindergarten or pre-school class as a learning aid! My son loves games like this. He is almost two and would have a great time with this. These are cute ideas. We was told to do activities with clothes pins for therapy. I really like the clothesline idea. Incorporate that with hanging up their artwork and you have a fun afternoon! This is great for fine motor skills for sure! 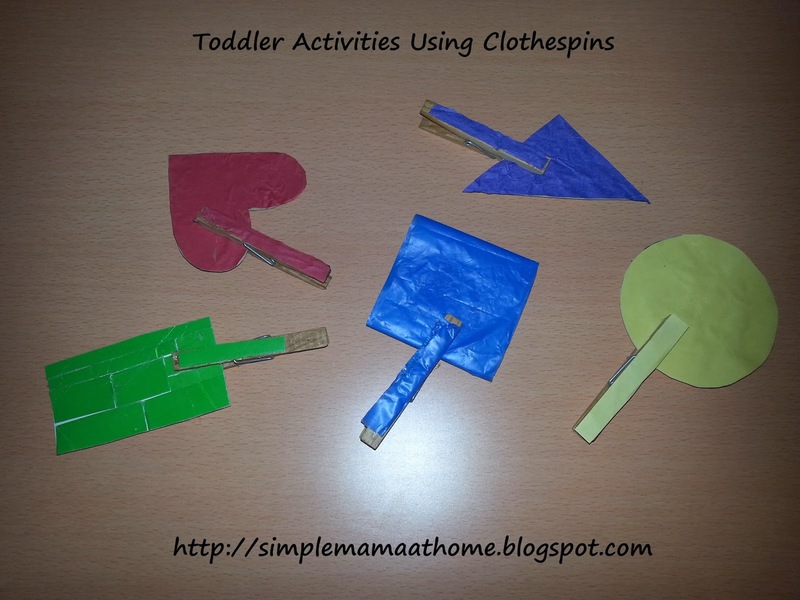 I saw something with a color wheel and painted clothespins for the kiddos to match like you did with the shapes. What great ideas! I especially love the clothesline! I am definitely going to do that for my little ones! I love number 2...get them started early, right? My son loves taking our dustpan broom and "cleaning". Oh this is such a smart idea - never thought to use clothespins. Thanks for sharing! Darling ideas...so wished I had all this info when my son was litte! I *love* the idea of the color matching game! My son is a little delayed in speech so anything to help him start saying more words would be great. An extra bonus? He's learning his colors! What super cute ideas! 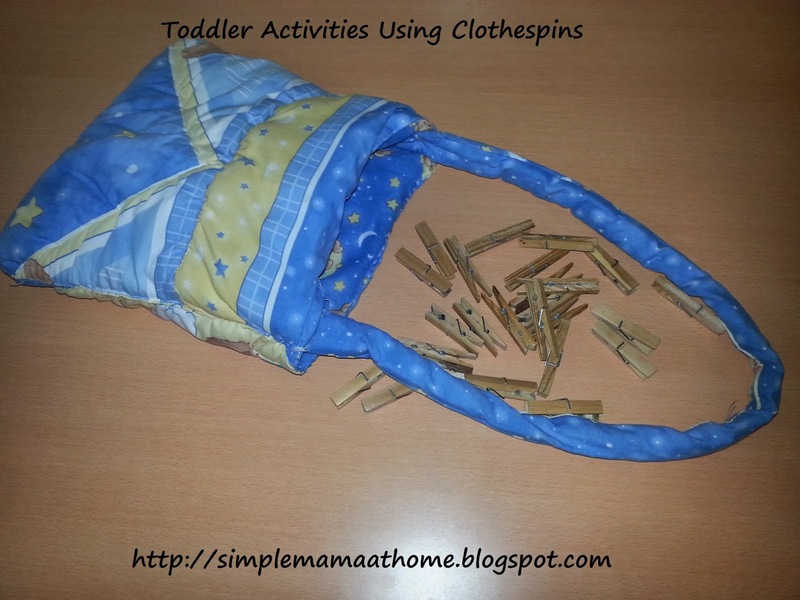 My kids have all gone through stages where they loved playing with clothespins too.